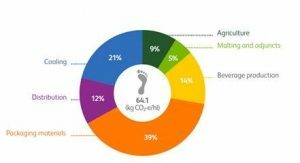 * 2014 Carbon Footprint – data based on 80% of the HEINEKEN volume, representative for the total carbon emissions of the company. Carbon footprint data is updated every three years, the next update will be in 2018. HEINEKEN has announced its ‘Drop the C’ program for renewable energy. With ‘Drop the C’ the company aims to grow its share of renewable thermal energy and electricity in production from the current level of 14% to 70% by 2030. HEINEKEN wants to drive a real change towards renewable energy and will therefore not purchase unbundled certificates to meet its reduction targets. In addition, new emission goals will be set for distribution and cooling and, for the first time, also for packaging. The brewer commits to set science based targets for these areas in the next two years. Since 2008 carbon emissions at HEINEKEN breweries have decreased by 41%  and in 2017 the company has already reached its 2020 emission targets in production. “Beyond production, distribution and cooling, we are also going to take a close look at our packaging, because it represents a significant portion of our carbon footprint. Packaging is an area where reductions will be harder to achieve because we simply cannot do this alone. We invite our business partners and others to work with us to reduce emissions across our business,” concluded Jean-François van Boxmeer who recently joined the CEO Climate Leadership Initiative at the World Economic Forum in Davos. HEINEKEN commits to increase its share of renewable energy in production from 14% today (renewable thermal energy and electricity combined) to 70% by 2030. This implies an 80% reduction target in carbon emissions  compared to the 2008 base year. During 2017 numerous projects have already been identified worldwide that will contribute to achieving the 2030 ambition. The targets will be externally verified by the Science Based Targets initiative. The company realizes that its diverse and extensive geographical footprint poses a challenge as it includes many countries in Africa, Asia and Latin America where renewable energy solutions are not readily available. HEINEKEN’s energy footprint in production is driven by thermal energy (scope 1 of GHG Protocol), which it uses to heat the boilers needed for brewing and by the electricity needed for the production process (Scope 2 of GHG Protocol). Today the split of this energy mix is 70% thermal and 30% electricity. The company has already made inroads to renewable electricity by using solar and wind energy. Its brewery in Massafra, Italy is one of the largest solar breweries in the world with a capacity of 3.3 MW, while its Göss brewery in Austria is carbon neutral. In Singapore, HEINEKEN is brewing with solar energy and in the Netherlands the company is using wind energy and solar power. Currently 29% of HEINEKEN’s global electricity usage is renewable. Today 7% of the thermal energy used by HEINEKEN is powered by biomass and biogas. Making progress in renewable thermal energy is much harder to achieve than on the electricity side. Renewable thermal energy is often self-produced and needs to be reliable to keep the breweries running. In addition, today there are very few commercial solutions available here. However, the company has also experienced the positive impact that renewable thermal solutions can have on the communities in which it operates. Unproductive waste from communities can be turned into energy and provide income for the local people. In Vietnam, for instance, the company sources rice husks from local farmers to heat its brewing boilers. In Brazil a new biomass boiler was fired up in 2017 at the company’s brewery in Ponta Grossa, solely using woodchips from certified reforestation companies. HEINEKEN will continue to embark on reforestation projects which help to offset carbon emissions and also support water preservation. Currently the company has reforestation projects in Mexico, Spain and Indonesia. Internally HEINEKEN will start piloting Carbon Shadow Pricing to help drive sustainable investment and innovation decisions. HEINEKEN will set new emission reduction targets for distribution, cooling and packaging in the next two years. These three focus areas, part of the GHG protocol’s scope 3, are difficult to tackle and neither HEINEKEN nor the industry can drive a reduction in carbon emissions on its own. For distribution, the company will expand its reduction scope, currently only covering the Americas and Europe. For cooling, a focus area with HEINEKEN buying green fridges for many years already, the company will define new reduction targets. For packaging, reaching reduction targets will be most challenging given that it requires broad collaboration and changes in consumer behaviour. HEINEKEN is therefore committed to working with the industry, suppliers, governments, customers, consumers and other relevant parties. Collaboration, for instance, will be needed to increase the recycling rate of materials used in cans and bottles, reduce the amount of glass and other materials used in packaging and to support suppliers to move to renewable energy in their factories. HEINEKEN’s vision for renewable energy is called ‘Drop the C’, this name is inspired by the idea that taking the C out of CO2 leaves Oxygen. The play on words is also about ensuring sea levels do not continue to rise. Through “Brewing a Better World”, sustainability is embedded in the business and delivers value for all stakeholders. HEINEKEN has a well-balanced geographic footprint with leadership positions in both developed and developing markets. Reduction of 41% in relative terms i.e. CO2 emissions reduction per hectolitre of beer produced. In absolute terms HEINEKEN production emissions have dropped by 7% even though production volumes grew by 57% in this time period. Relative reduction: CO2 emissions reduction per hectolitre of beer produced.